By the way, they are based in Apopka (near Orlando), and about 2.5 hours away from me...they offer tours of the nurseries...sounds like a possible plan for tomorrow!!! 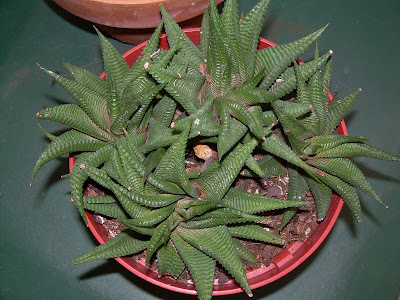 Well, this is a very cool (awesome) Haworthia! I found it at Walmart today...it was all alone...calling my name to bring it home. 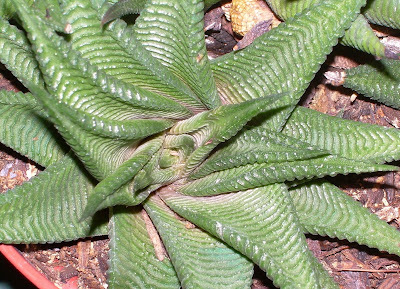 It is a Haworthia Limifolia. I love the way it sort of swirls around, and has the ridged leaves! I feel dizzy if I stare at it too long!!! The dark green coloring is also very nice. It feel hard to the touch, which surprised me, because a lot of haworthia feesl kinda juicy, since it is so full of water...so...anyway...just thought everyone would love to see this fine feller!! This sort of alien-like fairy (well, she seems to have wings), was in a Happy Meal, and my grown daughter intended to pitch her...(she was thrown in the garbage)...but... when my eyes fell upon her, she looked as though she needed a new home. I thought she would settle in quite nicely amongst my alien-like Kalenchoe! Her plastic self will weather the elements, and provide me with even more whimsical entertainment!!! YES!!! 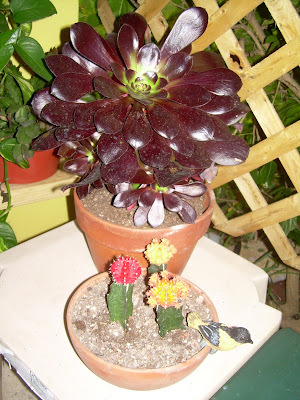 The photo on the left was my Bronze Tea Cup Hybrid Aeonium in January when I first bought it. I have had it on my front porch in semi-shade, and it has done well, but it has really darkened up. I tried sitting it out in more sun, but it really drooped, so I brought it back under cover. It is really pretty either way...I am anxious to know what all it will do throughout the year! I took a few more shots of it (below) just now...a side view that shows the babies underneath, and a view of it with my little moon cactuses, to show the ginormous size of this baby!!! When I was backing out of my driveway this morning, I noted two little side growths on one trunk of my Ponytail Palm (Beaucarnea recurvata). 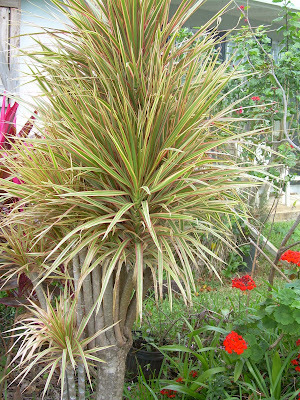 This succulent, palm-like shrub is a member of the Agave family and is known by several names. 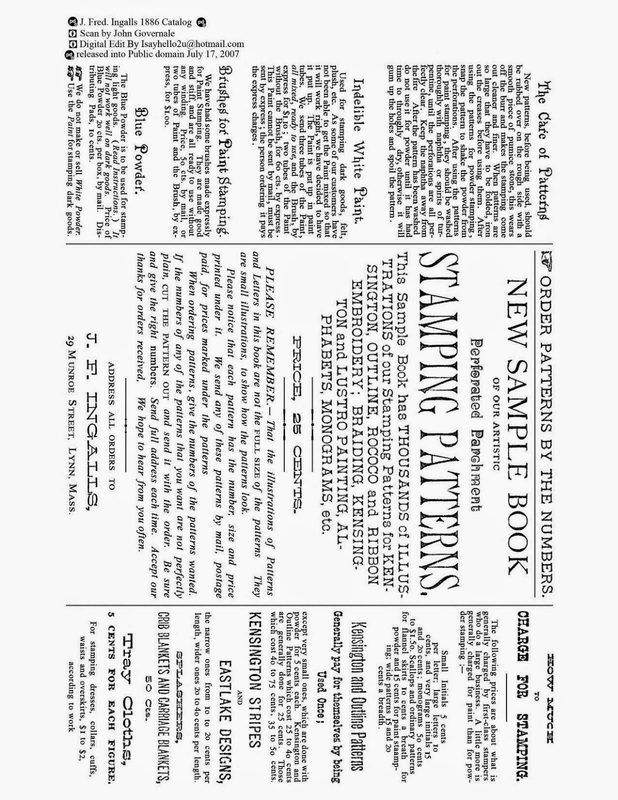 It has earned the name "elephant's foot" because of its bulbous base. 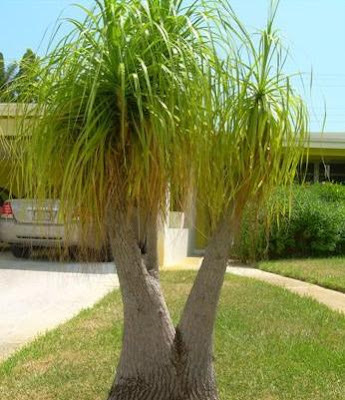 Because of its base and thin trunk have some people call it a bottle palm. . As a houseplant, the ponytail palm normally reaches about three feet in height. When grown outdoors in warm climates, it can easily reach 20 feet tall. My tree is approximately 10-12 ft. high. Normally it will only have one main trunk until it is a few years old. Then it develops branches towards the top. I wanted to come back home after work today and take a picture, but it was dark before I could get to it...so this shot was taken with a flash. A few years ago, our tree was tall, and only one trunk. We cut it down by about 1/2, and it really branched out...forming more thick, trunk -like branches, all with their own plummage on top. They are really weird, yet pretty trees. Mine has found itself in a terrible spot with our huge Black Olive tree competing with it...We trimmed the Black Olive back a few years ago as well, and we have had a good length of time where they were independantly happy. BUT...the time has come again to make a decision about whether to remove this Ponytail, or move it. It will be difficult because it will tear up our sidewalk to get it out, and we will need a crane to move it. It's gonna be a big job when the time comes!!! There was an article in todays paper about how we need to buy Organic, shade grown, Fair Trade coffee...to help the world, for sure. It got me thinking, and today at the grocery store I found 2 coffees that fit the bill. I am so excited to try them. My usual coffee has been the same for years...Folgers Medium roast. I had to do without it for a month or so after Hurricaine Katrina. It really does make you realize what a small world it really is. Look what I discovered this morning! Well, now this one I had to think hard on all day to see which of my plants had enough punch to deliver a colorful ending to my series!!! The Ferocactus latispinus seemed to have it going on...so the choice was simple! I added the small black lines to each of the spines at the end and I think it added a bit of SHARP to each one...made them stand out a bit more. I sure hope you like it! 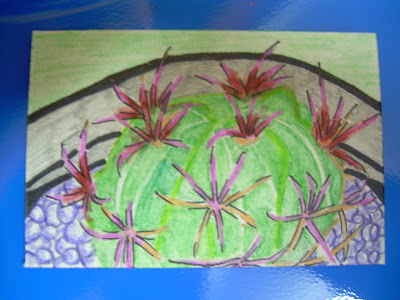 I think I do...maybe more than the other just because of the color and also the shape of the round cactus too. Other than the tire that looks like it fell off a 1920 Ford model of some sort, and was found lying in a field since...all mangled!!! P.S. Thanks for all of your kind comments!!! Well, I laid around all night watching American Idol, and then couldn't go to bed until I did my # 5 ATC. This is a picture of my Watch Chain (Crassula mucosa), blooming...pretty little yellow flowers, shaded with pink. I used only colored pencils for this one (no watercolors), Sharpie, and #2 pencil. It is cute...not memorable, but cute. I must try for spectacular for # 6!!! 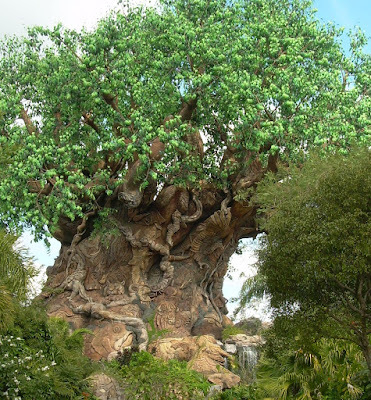 TREE OF LIFE, in the center of Animal Kingdom, modelled after the Baobab Tree. 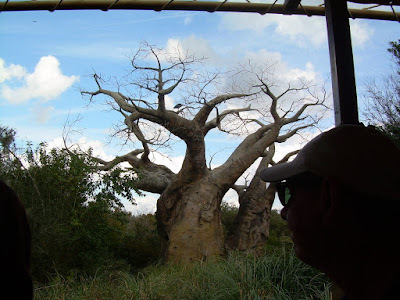 Here are a few shots I took of the Baobab tree, from Africa...while I was on the safari at Animal Kingdom, Disney World on Monday. The tree is quite unusual looking and intriguing. 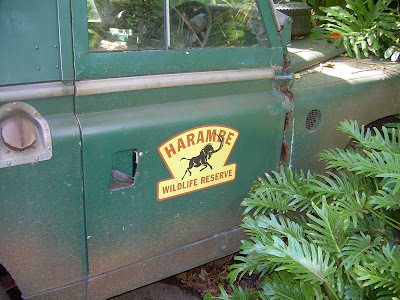 According to Go Florida ,the safaris are described as expeditions into the wilds of Africa beginning at the edge of a typical wildlife reserve in the coastal village of Harambe, with its bustling architecture. 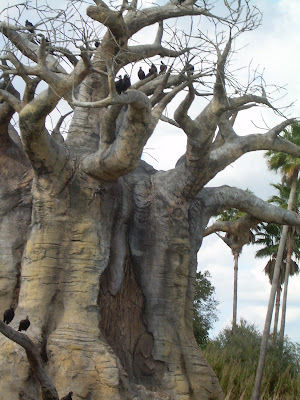 A huge, gnarled baobab tree, traditional icon of the African savannah, serves as the starting point for Kilimanjaro Safaris. Traveling in large, open-sided safari lorries, guests follow bumpy trails exploring 110 acres of forests, rivers, hills and grasslands filled with free-roaming antelope, rhinos, hippopotamus, zebra, crocodiles, baboons and other creatures. The high adventure culminates in a race to save an elephant herd from a gang of dangerous ivory poachers. The journey ends at Pangani Forest Exploration Trail where guests can disembark and walk through a bamboo jungle inhabited by two troops of lowland gorillas, see hippos from an underwater viewing area and explore a forest of exotic birds. Adansonia digitata, or Baobab tree, was named in honour of Michel Adanson, the naturalist who first saw it in Senegal, Africa about 1750. The Baobab tree is a strange looking tree that grows in low-lying areas in Africa and Australia. It can grow to enormous sizes and carbon dating indicates that they may live to be 3,000 years old. One ancient hollow Baobab tree in Zimbabwe is so large that up to 40 people can shelter inside its trunk. Various Baobabs have been used as a shop, a prison, a house, a storage barn and a bus shelter. When bare of leaves, the spreading branches of the Baobab look like roots sticking up into the air, rather as if it had been planted upside-down. The African bushman has a legend that tells of the god Thora. He took a dislike to the Baobab growing in his garden, so he threw it out over the wall of Paradise on to Earth below, and although the tree landed upside-down it continued to grow. The tree is certainly very different from any other. The trunk is smooth and shiny, not at all like the bark of other trees, and it is pinkish grey or sometimes copper coloured. It is not surprising that such a strange looking tree should have superstitions linked to it. Some people believe that if you pick a flower from a Baobab tree you will be eaten by a lion, but if you drink water in which a Baobab's seeds have been soaked you will be safe from crocodile attack. Baobabs are very difficult to kill, they can be burnt, or stripped of their bark, and they will just form new bark and carry on growing. When they do die, they simply rot from the inside and suddenly collapse, leaving a heap of fibres, which makes many people think that they don't die at all, but simply disappear. A Baby Baobab tree looks very different from its adult form and this is why the Bushmen believe that it doesn't grow like other trees, but suddenly crashes to the ground with a thump, fully grown, and then one day simply disappears. No wonder they are thought of as magic trees. Baobabs, grown from seed, are a popular choice for cultivation as bonsai plants. My favorite part of the trip to Animal Kingdom was looking at and appreciating all of the plant life! In a previous post about a month ago, I had discovered my supposed dead Kitten Ears (Tradescantia sillamontana, otherwise known as White Velvet, and Cobweb Spiderwort also) that I had just thrown down on the ground, had begun to regrow, and thrive. 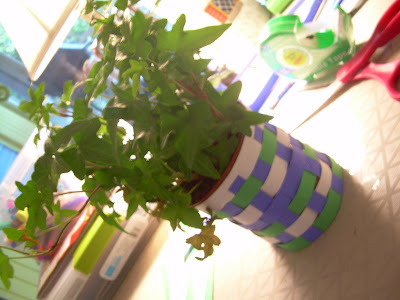 I put one in a pot on my kitchen windowsill, and 5 others in a pot on my front porch. There is one hidden behind the front middle one. Amazingly they are all continuing to grow and look very healthy! I hope to just get a nice overflowing pot of them one of these days. Maybe they just couldn't take such strong winter sun. I love their fuzzy leaves or "ears"!!! OMG! A famous fairy visited my garden! Well, I got tired of trying to catch a fairy in my garden, and I figured they come in when you are least expecting them, so I decided to set up a few teeney, weeney cameras at different distances away, so I could definately get a shot if one should arrive! 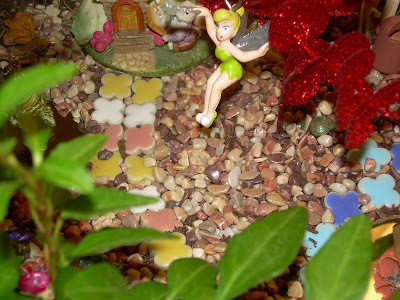 Well, this afternoon, I checked my film, and lo and behold, Tinkerbelle herself had come by!!! I believe it is Tink. She has the same shoes, I think. I got so excited when I saw the film, that I dropped my teeney weeney roll of film, and all the other shots were ruined! BUT...I did manage to save these two...how exciting to have a famous fairy come by to see my garden...maybe she will come back again sometime! Look who is peeking out at me! Trying to get my attention! She is saying "Come pet me, play keep away, or fetch with my soft bunny toy"!!! She thinks I have been on the computer far too long! I guess I have to agree with her...gotta go give out some lovin! Goodnight!!! This is my echeveria "Tippy" on steroids! She has sparkly tips! I got invigoraged tonight!!! My daugher and I have been craving a juice drink we previously had at Boma, an African restaurant at Disney's Animal Kingdom. They are very nice there, and give you the recipes for most all of their foods and drinks. Mix together and pour over ice! Yummy! My daughter has never forgotten this drink. OK...call me bored, or crazy...one or the other, for sure! 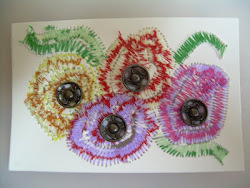 I am on a mission to try and make at least 6 of my Tiregarden ATC's. I believe this plant is called Aloe striata. I am getting into the watercoloring...it is very relaxing. I see now why people as they get older, might take up painting. I think it could be a very great activity for the brain! 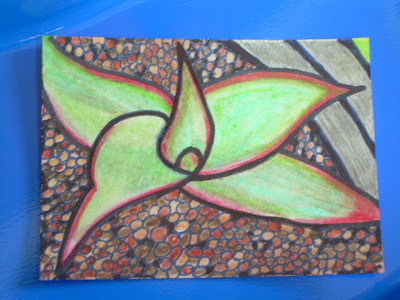 I created this ATC early this morning starting around 5am. My little girl, Lu (the chihuahua) woke me up then, so I got started on it even before the coffee could finish brewing!!! MUST HAVE COFFEE!!! Tonight my friend Karen, and her son Marc, and my Mom came down for Valentine Pizza, and beer/wine feast. 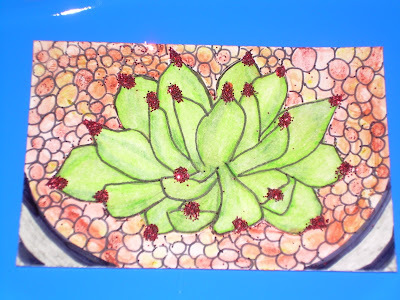 We ended up doing a couple of ATC's...and mine was, of course, the second in the series of my succulents...my flippin flapjack plant. Not too terrible after a couple glasses of wine! LOL. 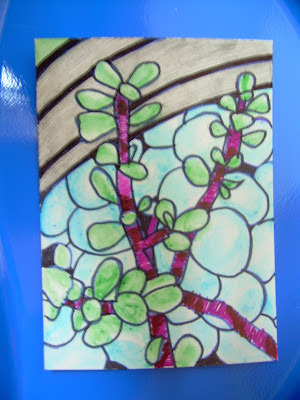 OK, tonight I took a chance at drawing one of my plants, and using Sharpie pen, watercolor pencils, and #2 pencil to creat an ATC. I am laughing at the amaturishness of it, but on the other hand, I am surprised I even did this well! LOL. I think I will try and make a series of these tiresgarden ones, using a different succulent each time. This plant is my variegated elephant bush. 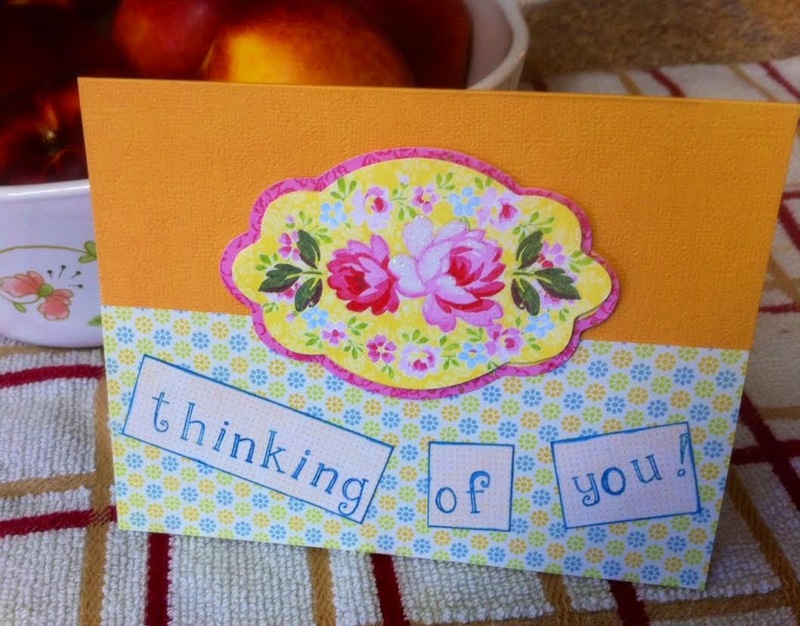 I am posting these on my ATC blog as well. Oh wow...look at all these awesome titles I found today!!! I cannot say one sounds any better than the others...they all look equally GREAT! I found most in the gardening section in the 935.96 area, but a few are more in the biology area at 571.6and 583.56. I think I will read the rock gardening one first...I am interested in possibly trying to make some hypertufa rocks...I read an easy way of doing it at Dave's Garden last night...where you make up the mixture, and put a half shovel full into a grocery sized bag, and tie it off with a twist tie, turn upside down and wait two days and unwrap! Sounds so easy...the picture showed some quite cute rocks she had made too!!! You do not have to spray the inside of the bag with anything...the fake rock will come right out! Sounds too good to be true! Well...maybe I will give it a try this weekend! You see...we have ZERO rocks in south Florida...ZERO! OK...I proceeded ahead with what I had this afternoon to get my new succulents into the tire gardens! You can see that I really need a few more blue stones, and maybe a bit more of all my top dressings....but they look pretty good, I think. The only problem I can see is that my Mammillaria gracilis fragilis is camouflaged in the sea shells...I may need to remove the shells around that one plant...I have some black stones I can place around her. She is so covered with white stars, I feel the black background will really bring them out! I hope you will enjoy looking at them as much as I do! The one above has the only cactus I could not move. it is too big ...my Bunny Ears...the big green one with yellow glochids. Above is an almost all CACTUS tire. There is one aloe in there. Can you make out the camouflaged Mamillaria??? Now here come a few close up kinda sideways shots! THE END! That was fun! Thanks to SUE (after reading her blog this morning), I HAD TO GET UP OFF THE COUCH, and MAKE pancakes, GOSH DARN IT! For those of you in or near Scottsdale...the whole two days sounds wonderful! Wish I could be there...For this class on Saturday, in particular! "Cacti and Succulents as Living Sculpture"
In addition to leading the indoors out, a principle tenet of Modernism is bringing the outdoors in. Learn how to create living modern sculpture out of low-maintenance cacti and succulents in this hands-on workshop. Plant selection, dramatic staging, top dressing, potting, aesthetics, and maintenance will be discussed. Sux and more from my Mom's garden! Sometimes you don't realize what you have right under your nose! I pulled up to my Moms house this morning, and I have been noticing her kalenchoe in bloom for a few months now, but I had my camera and decided to take a few pics. I was surprised at all the succulents she had in her garden! A huge aloe, the kalenchoe, and a portulaca! The other plants were so colorful, I had to take a few pics of them as well. She has a hibiscus, cordyline fruticosa (Ti plants), Cordyline australis (? )and many other things in there too! It is very beautiful this time of year with the kalenchoe in bloom...it adds a punch of color along the front! My brother, sister-in-law, and I planted this garden for her about 6 years ago, and it has really filled in, and had more plants added over the years. I think it looks like it belongs in Better Homes and Gardens! Here they are....arrived today...found the box on my front doorstep when I get home from work!!! Yeah...excitement!!! Well, actually these top two were purchased form Home Depot here today...during my lunch break! This top one is called Crassula Obliqua "Tricolor"...hope it is labelled correctly...I need to research to be sure! This soft green-blue plant came without a tag...so still need to research this one! This one is a pretty little Ferocactus latispinus...love those red spines!!! How daring!!! Now I ordered this one based on the fact that I loved Aiyanas' from Water When Dry. It is called Mammillaria gracilis fragilis! Isn't it beautiful...covered with stars and also arrived with blooms! Here is my first split rock! Called Pleiospilos nelii. What a name! OK...last but not least is Anacampseros telephiastrum varigata. 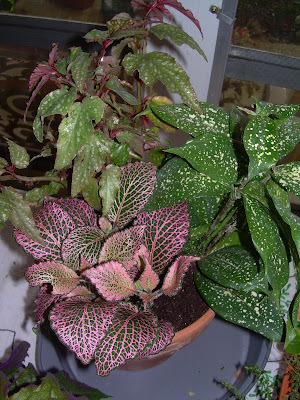 SHE is lovely with her bright pink leaves! Gotta get her in my succulent tires quick to try and keep that lovely pink color nice and bright in the sun! 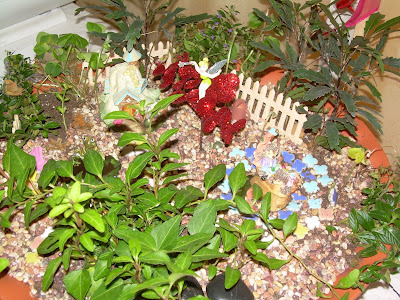 Fairy Garden supercedes Super Bowl! Kitten Ears coming back to life! A new home for "Tippy"!